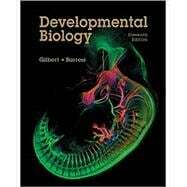 A classic gets a new coauthor and a new approach: Developmental Biology, Eleventh Edition, keeps the excellent writing, accuracy, and enthusiasm of the Gilbert Developmental Biology book, streamlines it, adds innovative electronic supplements, and creates a new textbook for those teaching Developmental Biology to a new generation. Several new modes of teaching are employed in the new Gilbert and Barresi textbook. The videos explaining development--as well as those from Mary Tyler's Vade Mecum--are referenced throughout the book, and several other valuable new elements have been added. * NEW Dev Tutorials: Professionally produced video tutorials, presented by the textbook's authors, reinforces key concepts. * Web Topics: These extensive topics provide more information for advanced students, historical, philosophical, and ethical perspectives on issues in developmental biology, and links to additional online resources. * Plus the full bibliography of literature cited in the textbook (most linked to their PubMed citations). Included with each new copy of the textbook, Vade Mecum3 is an interactive website that helps students understand the organisms discussed in the course, and prepare them for the lab. The site includes videos of developmental processes and laboratory techniques, and has chapters on the following organisms: slime mold (Dictyostelium discoideum), planarian, sea urchin, fruit fly (Drosophila), chick, and amphibian. * Textbook Figures & Tables: All of the textbook's figures, photos, and tables are provided both in JPEG (high- and low-resolution) and PowerPoint formats. All images have been optimized for excellent legibility when projected in the classroom. Scott F. Gilbert is Howard A. Schneiderman Professor Emeritus at Swarthmore College and a Finland Distinguished Professor Emeritus at the University of Helsinki Institute of Biotechnology. He teaches developmental biology, developmental genetics, and the history of biology. After receiving his B.A. from Wesleyan University, he pursued his graduate and postdoctoral research at The Johns Hopkins University and the University of Wisconsin. Dr. Gilbert is the recipient of several awards, including the first Viktor Hamburger Award for excellence in developmental biology education, the Alexander Kowalevsky Prize for evolutionary developmental biology, honorary degrees from the Universities of Helsinki and Tartu, and the Medal of François I from the Collège de France. He is a Fellow of the American Association for the Advancement of Science, a corresponding member of the St. Petersburg Society of Naturalists, and on the International Advisory Board for the National Institute of Basic Biology in Japan. He has been chair of the Professional Development and Education Committee of the Society for Developmental Biology. His research pursues the developmental genetic mechanisms by which the turtle forms its shell and the mechanisms by which plasticity and symbionts contribute to development. Michael J. F. Barresi is an Associate Professor at Smith College in the department of Biological Sciences and Program in Neuroscience. Dr. Barresi was a Biology major and Studio Art minor at Merrimack College. After he received his B.A., Dr. Barresi pursued his doctoral research on muscle fiber type development at Wesleyan University in the laboratory of Dr. Stephen Devoto. He completed his postdoctoral fellowship in Dr. Rolf Karlstrom's laboratory at the University of Massachusetts in Amherst, investigating the development of commissure formation in the zebrafish forebrain. At Smith College, Dr. Barresi's laboratory investigates the molecular and cellular mechanisms governing the development of neural stem cells, commissure formation, and neurodevelopmental responses to environmental teratogens. He has been a member of the Professional Development and Education Committee of the Society for Developmental Biology. Dr. Barresi is an innovator in the classroom, pioneering the use of web conferencing, documentary movie making, and active learning pedagogies in Developmental Biology. Since 2005, he has successfully taught course-based research laboratories in Developmental Biology. In connection with his NSF CAREER award, Dr. Barresi created the "Student Scientists" outreach program to help train and inspire primary and secondary education teachers to infuse investigative curriculum in their classrooms. He was the recipient of the 2012 Sherrerd Prize for Distinguished Teaching at Smith College.